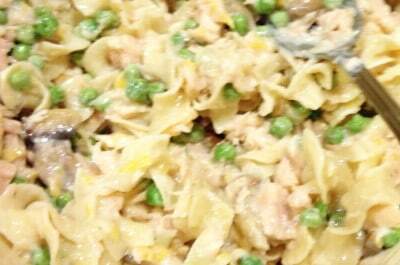 As I was brainstorming meals, tuna casserole came to mind. I didn’t grow up eating this dish but I kind of like the idea. Maybe because I’m always looking for ways to add more omega-3 fatty acids to our diets. I make tuna sandwiches but it would be nice to use canned tuna on a dinner meal (it works great in macaroni and cheese too). 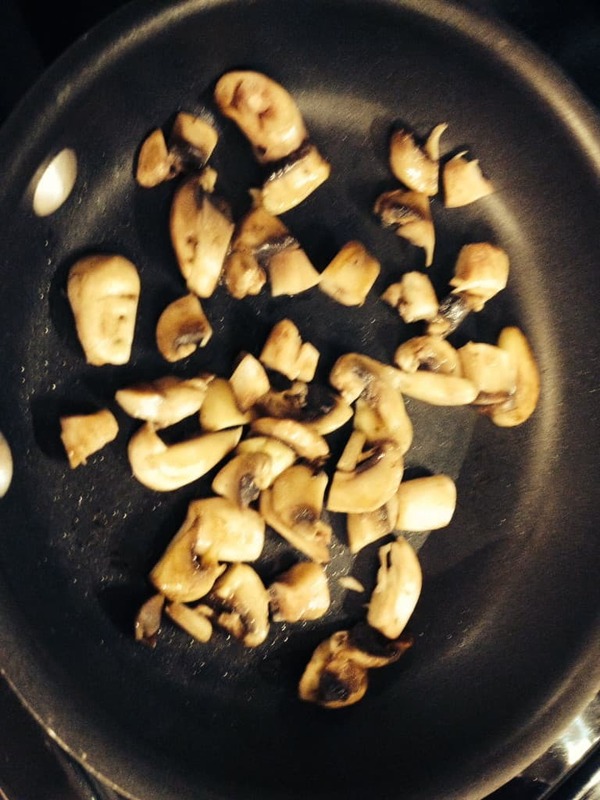 Most traditional tuna casserole recipes call for cream of mushroom soup, something I don’t have on hand. 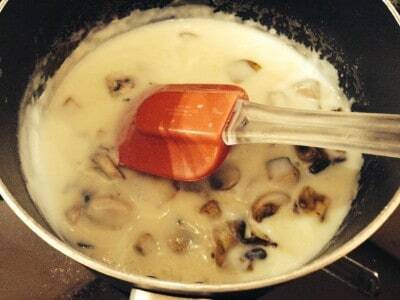 So I attempted my own cream of mushroom sauce from scratch (can’t really call it soup). 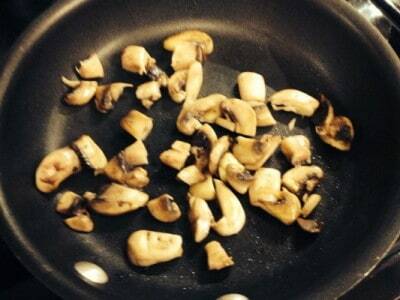 First, I sautéed a cup of mushrooms in some oil and chopped them into smaller pieces. Then, in a separate pan, I added 1/2 Tbsp each of butter and olive oil and 1 Tbsp flour. As the butter started melting, I added in 1 cup of milk and kept stirring (I got the idea from this basic white sauce recipe). I stirred until it starts thickening then I add the mushrooms, salt and garlic powder. Once it was done I set it aside. In a medium bowl I added two small cans of tuna, 1 cup peas, 1 cup cheddar cheese, cooked egg noodles and the above sauce and mixed it until well combined. I then placed this mixture on a sprayed 9X13 glass dish. I topped with a breadcrumb/parmesan cheese mixture and cooked for about 20 minutes at 400F. This had a good flavor but was a bit dry. So next time I will add more milk and add some onion. I also think it needs a bit more noodles. So this one isn’t ready to go yet. 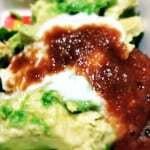 When I’m done perfecting my 30 meals, and side dishes to mix and match, I plan to compile it all, probably in an e-book. And I will offer it FREE to you (my readers) first. So if this offer interests you make sure you are subscribed to this site. 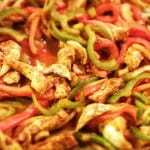 I had been making chili from a few different recipes until I finally came up with one that I wanted to keep making, which is posted here. I feel like chili kinda personal and should based on a cook’s (or family’s) preferences. You can add more vegetables, different beans and protein sources (for example, my neighbor says she adds steak to hers). Sometimes I’ll throw in a red or green bell pepper when cooking the onions. And you can increase the spice factor with red pepper flakes and hot sauce. Now that I have a base recipe down, I want to try different cooking variations. 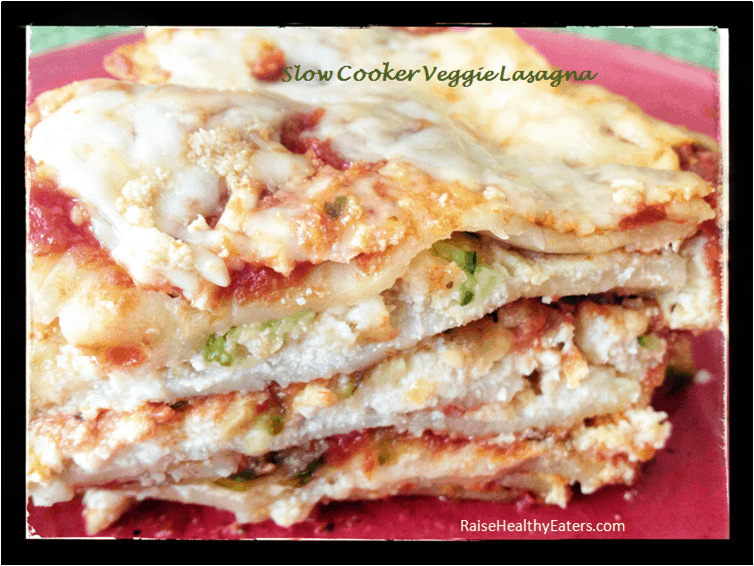 This meal is a good candidate for all day slow cooking. A previous poster mentioned her family is out of the house for 10 plus hours during the week and needs options that are ready when they get home, but not over-cooked. 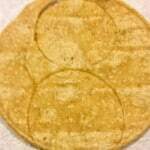 Using dried beans is key and this article shows you how. But this time, I didn’t use the slow cooker at all as it was later in the day. I started with the onions, cooking in some olive oil for 5 minutes then add the garlic for 1 minute. 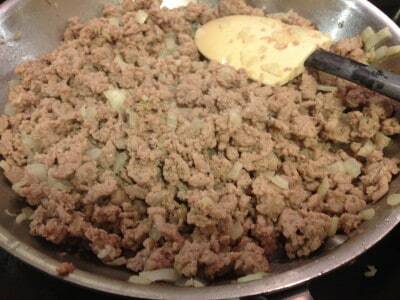 Then I cooked the meat, lean ground turkey. 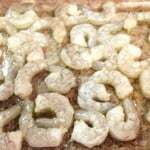 I drained some of the fat when it was done and dumped it in a large pan. 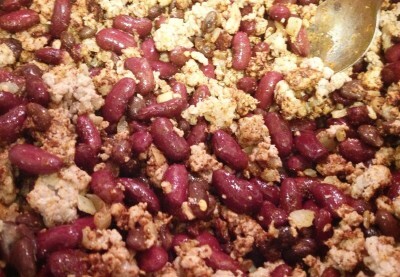 I added the drained beans to the meat and then added all the seasonings and stirred it all together. Last I added broth and tomato sauce, gently stirring until well combined. Heat oil over medium/high heat and cook until onion (and peppers if using) are softened, about 5 minutes. Add in garlic for about a minute. Add meat and stir until cooked through. When done drain the fat. 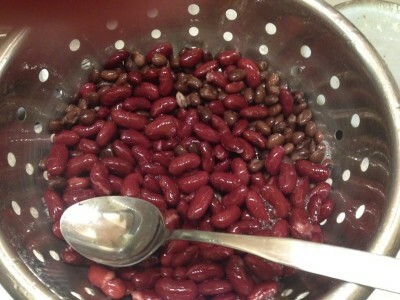 In a large pot, add the beans and the meat mixture. Add spices and mix with a spoon. Then add broth and tomato sauce and gently stir again. If needed, add more liquid to reach desired consistency. 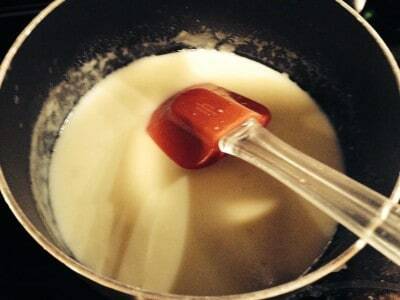 When the mixture boils, turn down to simmer and cover for about an hour or longer.